More Good Wife alums are joining The Good Fight. TVLine reports both Zach Grenier (pictured, left) and Jerry Adler have joined the upcoming CBS spin-off series. On The Good Wife, Grenier played David Lee and Adler played Howard Lyman. The legal drama ended this past spring after seven seasons. The spin-off will pick up year after the events of The Good Wife and follow a young lawyer, Maia (Rose Leslie), who becomes entangled in a massive financial scam. 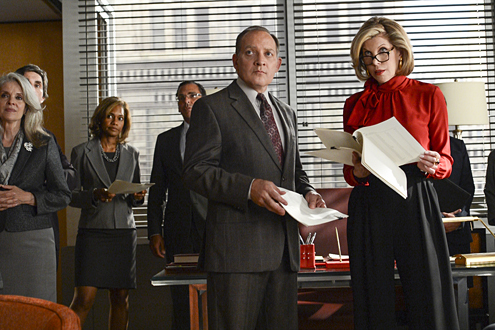 The cast also includes fellow Good Wife alums Christine Baranski, Cush Jumbo, Sarah Steele, and Gary Cole. New cast members include Delroy Lindo, Erica Tazel, Paul Guilfoyle, and Bernadette Peters. The Good Fight is slated to debut in February. More about: CBS TV shows: canceled or renewed?, The Good Fight, The Good Fight: canceled or renewed?, The Good Wife, The Good Wife: canceled or renewed?